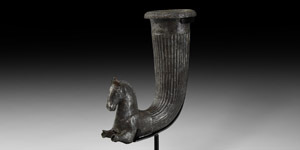 A silver rhyton comprising a fluted tubular curved body with rolled rim and lotus-flower detailing, and a protome of a galloping horse with head erect, ears pricked and a knop finial to the stiffened mane, forelegs extended; narrow conical spout to the chest; mounted on a custom-made stand. 775 grams total, 17cm (6 3/4"). Very fine condition; lower legs absent. From an important London collection; acquired from J.J Klejman, New York, USA, 29 October 1964; formerly in the Thompson family collection; accompanied by a copy of positive metallurgic analytical results, written by Metallurgist Dr. Peter Northover (ex Department of Materials, Materials Science-Based Archaeology Group & Department of Materials, University of Oxford). See Garnsey, P. Food and Society in Classical Antiquity, Cambridge, 1999 for discussion of the use of the rhyton at Greek feasts. Rhytons formed part of the array of formal tableware for use at a ceremony such as a religious libation or a symposion drinking party. The rhyton was dipped into the krater wine container and held above the drinker's mouth with the spout covered by a thumb, then opened to release a stream of wine into the mouth.